Euonymus fortunei is a shrub-like vine native to Asia. Euonymus fortunei can outcompete native vegetation by depleting soil moisture and nutrients, blocking sunlight and by forming a dense vegetative mat that impedes the growth of the seedlings of native species. It spreads by escaping from gardens or floating down streams, where it invades undisturbed forest and riparian areas. Locally, Euonymus fortunei is spread by wildlife and birds which feed on its seed structures. E. fortunei has dark green, shiny, egg-shaped leaves that are from 1 to 2 1/2 inches long and occur in pairs along the stems; they have toothed margins and silvery veins. 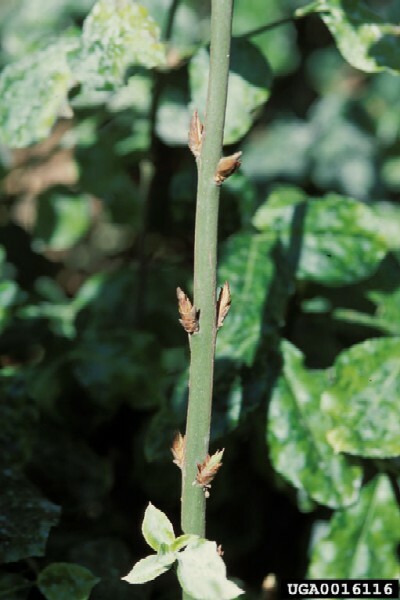 Stems are narrow, minutely warty, and have abundant rootlets or trailing roots. Clusters of inconspicuous green-white flowers are produced on a long stalk during the summer months and are followed in the autumn by pinkish to red capsules that split open to expose seeds adorned with a fleshy orange seed coat, or aril (Remaley, 1998). Euonymus fortunei was introduced into the U.S. in 1907 as an ornamental ground cover (Remaley, 1998). Euonymus fortunei tolerates a variety of environmental conditions, including poor soils, full sun to dense shade, and a wide pH range. It does not do well in heavy, wet soils. Natural forest openings resulting from wind throw, insect defoliation or fire are vulnerable to invasion and provide conditions for satellite populations of E. fortunei to get started. E. fortunei also commonly invades riparian areas (Remaley, 1998). Euonymus fortunei spreads vegetatively with the help of lateral shoots produced along its long, main branches. It also spreads as new plants emerge from rootlets also produced along the stem at short intervals. Flowers formed in the summer produce mature fruits by fall that are equipped with fleshy edible structures (arils) that are fed on by birds and other wildlife which disperse it (Remaley, 1998). Recommended citation: Global Invasive Species Database (2019) Species profile: Euonymus fortunei. Downloaded from http://www.iucngisd.org/gisd/species.php?sc=575 on 21-04-2019. 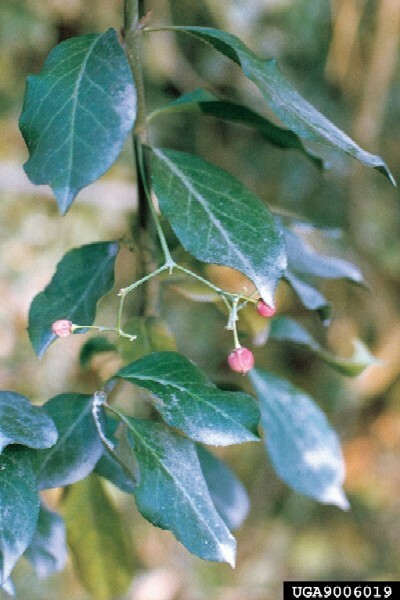 Traits that make Euonymus fortunei a desirable ornamental plant, such as its rapid growth, evergreen nature, and tolerance of harsh conditions, also make it a threat to natural areas. E. fortunei can outcompete native vegetation by depleting soil moisture and nutrients, blocking sunlight, and by forming a dense, vegetative mat that impedes the growth of seedlings of native species. Vines on trees continue climbing and can eventually overtop them, covering the leaves and preventing photosynthesis (Remaley, 1998). Physical: Grubbing, a labour intensive method, is effective for small populations or environmentally sensitive areas where herbicides cannot be used. A pulaksi, or similar digging tool, should be used to remove the entire plant, including all roots and runners. Juvenile plants can be hand-pulled when the soil is moist and root systems are small. Portions of any remaining root system may resprout. All plant parts, including stem fragments and mature fruits, should be bagged and disposed of in a trash dumpster to prevent reestablishment. 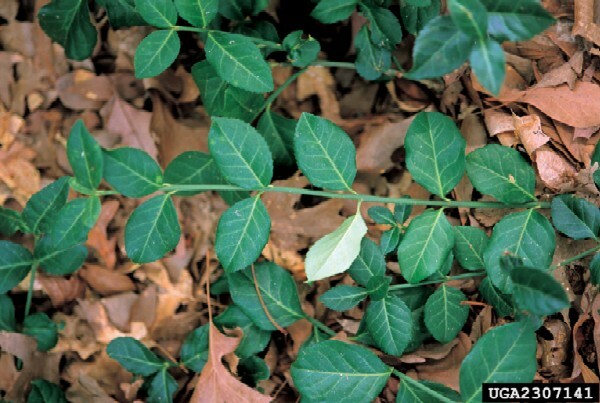 Chemical: Cut stem treatment, using systemic herbicides applied to freshly cut stems, is effective in areas where vines are well established on or around non-target plants, or where they have grown into tree canopies or other vertical surfaces. The stem should be cut as close to the ground as possible and immediately followed by an application to the cut stem of a 25% solution of glyphosate (e.g., Roundup) or triclopyr (e.g., Garlon) and water. This procedure is effective at temperatures as low as 4.4 degrees C (40 degrees F). Subsequent foliar application of these herbicides may be required. Foliar applications of herbicide can be used to control large populations. It may be necessary to precede foliar sprays with cut stem treatments to reduce the risk of damage to non-target plants. For foliar applications, a 2% solution of glyphosate or triclopyr and water plus a 0.5% non-ionic surfactant is recommended to thoroughly wet all foliage but not so heavily that it drips off leaves and affects desirable plants (Remaley, 1998). Informations on Euonymus fortunei has been recorded for the following locations. Click on the name for additional informations. Remaley, T. 1998. Climbing Euonymus. Plant Conservation Alliance. Summary: A detailed report on the biology, ecology and distribution of E. fortunei. Hutchison, M. 2002. 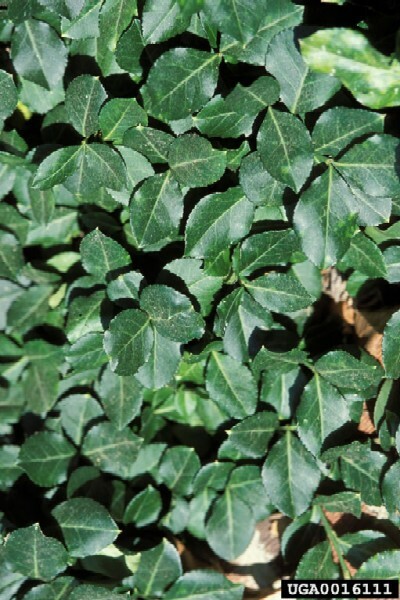 Vegetation Management Guidelines: Wintercreeper. Conservation Commission of Missouri. Summary: A short summary of E. fortunei and similar species. Summary: An information network that provides geographic distribution information on E. fortunei. USDA-NRCS (United States Department of Agriculture). 2002. Euonymus fortunei. The Plants Database. Natural Resource Conservation Service. Summary: A database that provides links and information on E. fortunei.